SFX Machine Pro, Other effects bundle or multi-effect from Sfx Machine. 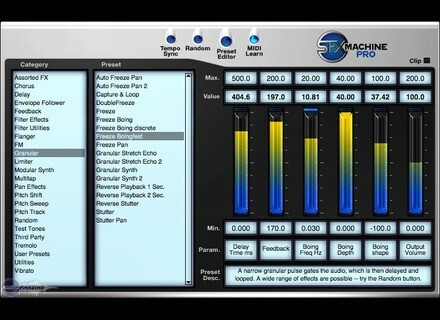 SFX Machine is now available in RTAS format for Digidesign's Pro Tools. 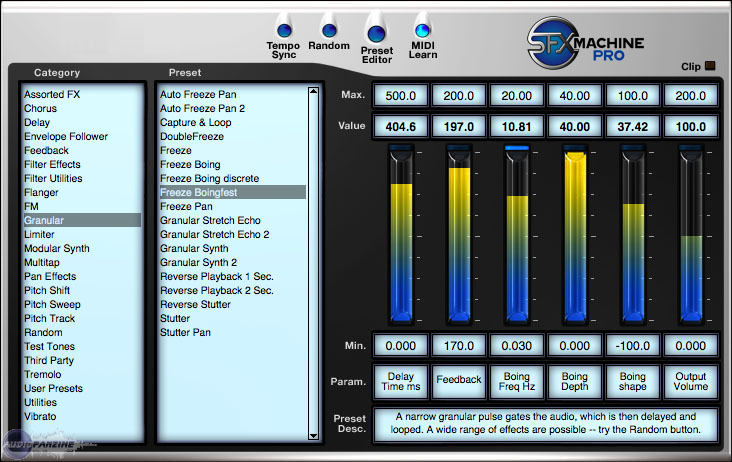 SFX Machine Pro for RTAS is a multi-effects sound design tool, providing access to audio effects described by SFX Machine as ranging "from the conventional to the bizarre." "SFX Machine Pro for RTAS lets you create your own effects from scratch and also serves as a “Swiss Army knife” of audio utilities," SFX Machine said. For more info, check out www.sfxmachine.com. IK Multimedia Releases T-RackS 3 IK Multimedia has announced that T-RackS 3 is now shipping. MachineCodex Updates AudioCodex to v1.48 MachineCodex Software has updated AudioCodex to v1.48. Christian Budde Presents Simple Chorus Christian Budde has released Simple Chorus, a free plug-in that was originally created as part of Christian's Delphi ASIO & VST Open Source Project.